Enjoy this beautiful experience. The Adventure is Here! Visit to the Shop of souvenirs and Purification with CHAMAN MAYA (45 minutes). Tour inside Chichen Itzá with Guide cerfied SECTUR México. Free time in CHICHEN ITZÁ for photos and explore on your own (60 minutes). Buffet food, remember to eat at least two tacos of Cochinita Pibil (45 minutes). Entry and Time to swim in the CENOTE XCAJUM (40 minutes). Round trip Transportation in Bus / Van with Air Conditioning from the lobby of your Hotel. Transportation Maritime Cancun - Isla Mujeres. One hour of food type Buffet with Beberage included. CHICHEN ITZA, one of the seven wonders of the world full of much history, through its buildings you will travel to the past and you will be amazed with the beauty of this place. 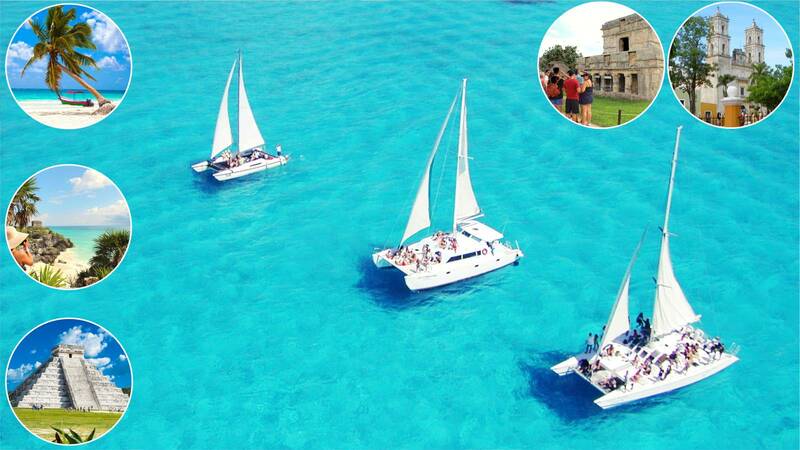 You will find the observatory, the great Kukulcan castle, the ball game and more. TULUM, the only Mayan ruins located in front of the beautiful Caribbean Sea, with impressive landscapes worthy of being visited and admired. The beaches of Tulum are the beautiful ones that you will find, its blue tonality will leave you amazed. ISLA MUJERES was a center of pilgrimage, mainly for the women who came to venerate Ixchel, the goddess of the moon, of fertility and childbirth. Isla Mujeres is not a product of the imagination, it is a dream come true. The snorkel in this place is amazing. Tax for the use of Professional Video Cameras / GoPro inside Chichen Itzá. $ 146.00 Juniors 3 - 9 Years.